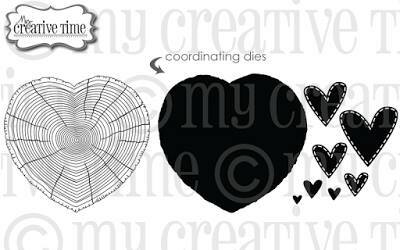 Today we are featuring another My Creative Time Favorite Stamp of the Month! This month, it's the gorgeous Carved Heart set! If this set has been on your wish list, you can pick it up here at a discount price. It's on sale for the entire month of June! The sale ends on June 30, 2016, at 12:00 AM PST. For my card today I embossed the gorgeous wood grain heart stamp from Carved Heart on a piece of vellum. I then took the coordinating die, and die cut the heart shape out of my card base and out of another piece of cardstock so that I could sandwich the vellum piece between them. After that I added "hello," made with the Fun Notes stamp and die set and a few hearts made with dies from Carved Heart. Oh What a Beautiful card. Love the pretty colors and the sweetness that you achieved using the carved heart!! The vellum adds that special soft look. Love the creative ways you used Miss Emma's goodies. YOU so ROCK!! Beautiful card! I love the big thanks stamp...it looks great against the wood grain.